One hundred and fifty years ago, on November 19, 1863, President Abraham Lincoln delivered what would come to be known simply as the “Gettysburg Address” at the dedication of the Gettysburg battlefield cemetery. Doesn’t sound like an agricultural story, does it? But it was William Saunders, the first horticulturist and superintendent of experimental gardens with the newly created U.S. Department of Agriculture, whom President Lincoln called on to fashion a national cemetery at Gettysburg, one to be unlike any preceding monument for the fallen. What Saunders created was a revolution in battlefield cemeteries. He used a simple radial configuration grouping Union dead by state (Confederate bodies were returned to their home states), with each grave marked by a flat, gray, granite rectangle. 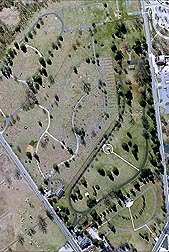 Surrounding the graves, Saunders created an extensive planting plan to frame the site’s vistas, specifying uncommon choices of trees and shrubs. Many of the trees and shrubs were those recently introduced to this country by Saunders himself. Saunders made monumental contributions as the first USDA horticulturist and superintendent of experimental gardens from 1862-1900, where he, “more than any other official connected with the early history of the Department of Agriculture . . . believed in and contributed to its usefulness,” wrote Frank L. Evans, chief, Divisions of Accounts, circa 1906, in an unpublished reminiscence, now part of the National Agricultural Library Special Collections. 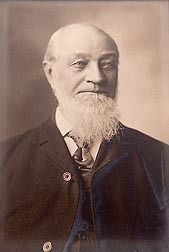 In addition, in 1867, Saunders helped found and was the first president of the National Grange, the oldest American agricultural advocacy group with a national scope. This combination—no grand headstones or sculptures and extensive green landscaping—was unique, never previously seen in either Europe or the United States. At President Lincoln’s request, Saunders spent an evening at the White House presenting his proposed design. The President heartily approved. “He [Lincoln] was much pleased with the method of the graves, saying it differed from the ordinary cemetery, and after I had explained the reasons, said it was an admirable and befitting arrangement,” Saunders recounted in a historical journal that is part of the National Agricultural Library (NAL) Special Collections. The library is part of USDA’s Agricultural Research Service. In addition to what was to become the Soldiers’ National Cemetery at Gettysburg, Saunders went on to design the landscaping for Lincoln’s tomb, the west façade of the Capitol, and many other important locations. While still the USDA superintendent of experimental gardens, Saunders became president of the Washington, D.C., Parking Commission, where he developed a system of parks and street tree plantings that became an enduring foundation for the city’s reputation as the “City of Trees.” He oversaw the planting of 80,000 trees in Washington, D.C. 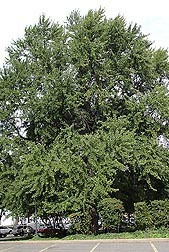 But Saunders did far more for the country than design landscaping.He also introduced hundreds of economically important plants, including Japanese persimmon; Eucalyptus globulus tree; Japanese cedar (Cryptomeria japonica); 300 varieties of winter-hardy apples from Russia that had a profound effect on the Northeast’s apple growing; camphor tree; one of the first magnolia trees in Washington D.C.; and many more. In the 1860s, some top agricultural services in existence today were started. Examples include establishment of a national agricultural library, a plant and animal introduction program, and the gathering of national agricultural statistics. Saunders (second from left in this 1867 photo) and other high-ranking officials were part of the supporting cast of first Commissioner of Agriculture, Isaac Newton (fifth from left), who took the helm in efforts to create these services. 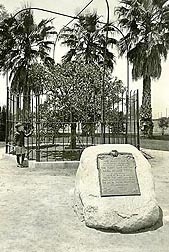 Eventually, in 1873, Saunders presented two of the navel orange trees, which he was calling the “Bahia navel,” to an old friend, Eliza Tibbets, who was moving from Washington, D.C., to join her husband in the new community of Riverside, California. 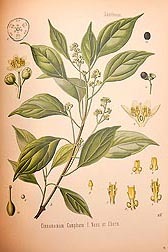 Saunders organized USDA’s first publication, a catalog from the U.S. Propagating Garden, including an entry for the camphor tree, one of many plants he introduced into this country. Tibbets had contacted Saunders for suggestions of a crop that would prosper in Riverside’s arid, Mediterranean climate. Riverside’s early settlers needed to find a crop that would do well in their dry and dusty environment to ensure the town’s survival. Various other crops had had only moderate success. The navel orange was an immediate success and quickly spread to other parts of California. Luther Holt, publisher of the Riverside Press and Horticulturist, called it the “Riverside navel.” But cities around Riverside objected to that name, and eventually it was changed to the “Washington navel,” in honor of the source city—or perhaps our first president. Because the Washington navel orange is seedless, all of its many, many descendants are grafts from those original two trees. One of those trees, planted in downtown Riverside and now more than 140 years old, is alive and healthy. But far broader in impact than Saunders’s individual introductions, even as important as many of them have been, was his codifying of the mission of the USDA Experimental Gardens, which he headed from his initial appointment in 1862 until his death in 1900. These guidelines were presented in his “Catalogue of the Plants, Bulbs, Tubers, Etc., for Distribution from the U.S. Propagating Garden with a Report on the Objectives and Aims of the Garden.”Dated 1862, this catalog, with the guidelines, was USDA’s very first publication. It is available in NAL’s Special Collections. 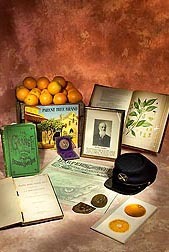 Saunders introduced the navel orange that gave rise to a California industry. Shown (in the fenced-in area) is one of the original two navel orange trees, circa 1920s. That “by experiment” was Saunders’s most significant contribution. He originated the standard for systematic evaluation and reporting about the characteristics of the thousands of new plants being introduced into the United States, explains ARS Deputy Assistant Administrator Robert Griesbach. ARS is the USDA agency that has inherited the Department’s germplasm collecting-and-preservation mission. 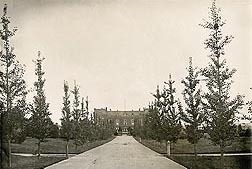 Saunders specified the planting of two lines of ginkgo trees, then a largely unknown landscape choice, to adorn the original USDA building in Washington, D.C., circa 1870. For instance, in just 2 years, from 1865 to 1867, the USDA Experimental Farm was used to evaluate and propagate more than 120 wheats, 167 ryes, 230 melon varieties, 70 peas, 50 grass species for hay production, and more than 500 strawberries, grapes, apples, and pears. That information was published and made available to farmers. “The precedent that Saunders set has had a profound effect, right down to the way we work today,” Griesbach adds. Tappahannock wheat is a typical example. Beginning in 1866, it was identified in the evaluation program as a superior wheat cultivar, noted for its high yields, early maturity, disease resistance, and flour quality. Saunders distributed the wheat to farmers in many locations and requested that each report back on the traits and success of Tappahannock. His correspondence demonstrated that the cultivar was widely adapted to many regions of the country, from New England to the lower South and through the Midwest. One of the two ginkgos remaining today, almost 150 years later. Saunders played an instrumental role in the creation of the U.S. National Arboretum. 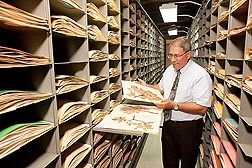 Here, ARS Deputy Assistant Administrator Robert Griesbach takes a look at one of the many plant specimens inside the herbarium at the Arboretum. There is no question this prediction has come true. Today, U.S. agriculture provides the people of this country with a bountiful low-cost diet, and in 2012, U.S. agricultural exports totaled more than $141 billion. When Saunders died in 1900, USDA statistician John Hyde was quoted in the New York Times obituary as saying that “the department has not begun to exhaust the suggestions of value made by Mr. Saunders.”—By J. Kim Kaplan, Agricultural Research Service Information Staff. For information about the materials or people mentioned in this article, contact Kim Kaplan, USDA-ARS Information Staff, 5601 Sunnyside Ave., Beltsville, MD 20705-5128; (301) 504-1637. "William Saunders: A Monumental Figure in USDA" was published in the September 2013 issue of Agricultural Research magazine.